At the heart of Cambodia, Phnom Penh is changing its appearance and climate of security to attract more visitors. Its newly appointed governor Kep Chutema, who took office in late February, has acknowledged the high level of anxiety surrounding the war in Iraq and heightened threats of terrorism. But he also has acknowledged Phnom Penh's ability to keep the horror of world events at bay. Despite years of hardship, Phnom Penh's infrastructure must be credited with tremendous improvement. The construction of new gardens across the river, the smoothing of main avenues and side streets, as well as flood protection and drainage improvement projects, have begun under the leadership of former governor Chea Sophara. We are proud that visitors now may take home photographs bearing witness to Phnom Penh's natural beauty, instead of its terror-filled history. However, travelers busy enjoying a riverside view must also be reminded of the photo opportunities growing alongside Norodom Boulevard and the city's riverbanks. For many, it is Phnom Penh's flowers that will add life and color to their albums. The plants dotting some of the capitol's most scenic routes are known to bear colorful flowers just in time for the Khmer New Year, sending revelers spirits' high and serving as signs of good luck. 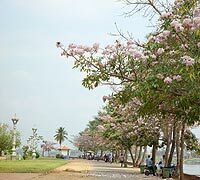 The pink-flowered plants growing along Norodom Boulevard are Phka Trabek Prei, or Guava flowers. 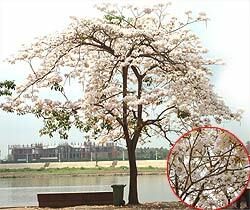 The variety blooming beside the riverbank is similar to Trabek Prei but are known to some locals as Khmer Sakura. The name is taken from a type of Japanese flow-er. The beautiful view from Phnom Penh's riverbank is made even more breathtaking by the Rukha Vithei (tree-lined streets) leading up to it. Unpolluted by tall factory smoke stacks, the skyline often is blue and people's spirits bright. 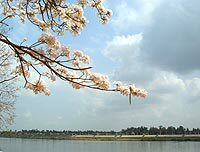 White, pink and red Khmer Sakura flowers blooming by the riverbank stretch from Ouk-na Loam pagoda all the way to Phsar Chas. Some observe that they bloom from February until the mid-March. 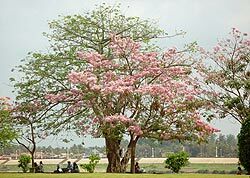 Even as it reaches the end of its life cycle, the Khmer Sakura leaves a remarkable impression. After the petals drop from the trees, they carpet the pavement with color. Approximately fifty different plants grow along the riverbank in Phnom Penh, making this one of ASEAN's most photogenic waterways. Walking, one of the least expensive means of achieving good health, also is the best way to see the city. The pedestrian-friendly walkway stretching from the Cambodiana Hotel all the way to Phsar Chas and Wat Phnom is paved with gravel and will allow even fly-by-night travelers an opportunity to know Cambodia. By walking, visitors may meet the locals, people armed with a welcome smile and friendly ‘hello’. The Royal Palace and the Silver Pagoda present themselves along this walk on Sothearos Boulevard. And further on, you will see a cluster of cafes and bars owned by foreign and Khmer business people. Most famous of these river front cafes is the Foreign Correspondent Club, a bar and restaurant that once played host exclusively to foreign journalists but now is open to all. It is this stretch of road along Sisowath Way that is most popular with locals. Foreigners also flock to the river to sit in open-air cafes and sip beer or coffee, or to get a shoeshine for a mere 500 riel. Once your thirst is quenched, you may stay or rent a motodop, a motorcycle taxi, that will take you for a scenic drive to see the guava flowers along Norodom Boulevard for about 50 cents. Stopping at Independent Monument, grab a cyclo trip to Phsar Thmei (Central Market) for a round of shopping. This classic marketplace is divided into two sections with several entrances leading to a central, tall-ceiling arena. The most popular, accessible entrance is located in front of the New Lapaillote Inn. Here you will find a display of potted plants, flowers, T-shirts, local handicraft and Khmer silk products. Once you've filled your backpack with colorful souvenirs, hop onto another moto taxi and scoot back to the river for a bite to eat. The best time to sit by the water is around 4:30pm when what seems like the whole of Cambodia heads home from work. Many families, sweethearts and singletons flock to the area by bike, while others come on foot. Not everyone comes to play, however. The riverbank is home to one of the busiest night shifts in town. Children beg or sell flowers here, while cyclos and motodops rally for a fare. Vendors balance huge baskets filled with peanuts and fruit on their head, and men holding bunches of balloons hope that just one will take off, leaving a little money in its place. The straight stretch of riverbank plays host to every walk of Khmer life. While sitting by the water, don't forget to take pictures of the beautiful Sakura flowers to fill this chapter of life with color. These plants stand proudly protecting the riverbank from erosion, re-minding us that when faced with danger, faith in one's self is the best defense.